This is an amazing series. The main protagonist of the series, Kusuriuri, was first introduced in "Bakeneko," the final chapter of the Ayakashi: Japanese Classic Horror anthology series. 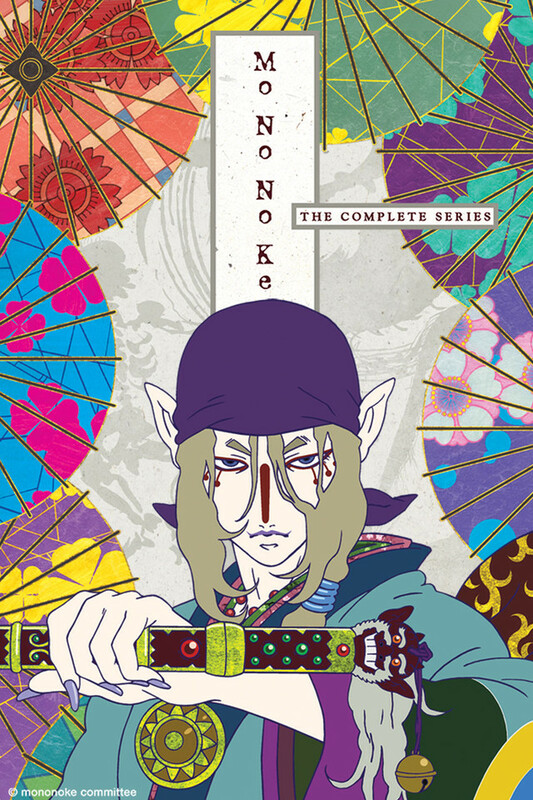 Mononoke was originally broadcast during the NoitaminA programming block in Japan. It is intimate and disturbing at the same time the basic story is The "Medicine Seller" is a deadly and mysterious master of the occult who travels across Japan in search of malevolent spirits called "mononoke" to slay. When he locates one of these spirits, he cannot simply kill it; he must first learn its Form, its Truth, and its Reason in order to wield the mighty Exorcism Sword and fight against it. The series takes place through several ages of Japan ending in the early 1900's. This is a series for adults no fan service here. The animation style plays off the artwork at the time period. Colorful, Bold and simple. The stories are thought provoking to bizarre. He must begin his strange exorcisms with intense psychological analysis and careful investigative work. He must first confront and learn about the mononoke before he even has the means to defeat it. The only think I don't like about this series is that it only has 12 episodes. The visuals play such an important part of making a show rememberable, and let me just say that Kurahashi Takashi did a damn well job doing that. The way the colors are used in a thriller is completely original and unorthodox. Not only were the visuals stunning, but the main character as well. The Medicine Vendor (aka Medicine Seller) is such an inspiring role model, keeping calm and composed throughout the whole show. All his words spoken with meaning behind them, steady and without fear while the people around him turn to chaos. Everything about this show is amazing, a must watch in my opinion. In 20 years I have seen nothing quite like Mononoke. The colours are breathtaking, The stories are unnerving. Each episode is like surreal paper collage dream. Choosing not to rely on gore and shock value, these ghost stories unfold like melancholy poetry. I originally started watching this due to the Seiyuu (Takahiro Sakurai) for Kusuriuri being the same as Oshino Meme in Monogatari series. I was not disappointed at all and definitely think supernatural mystery is a niche of his. The added artistry of making the whole thing look like it was done on washi paper really helps immerse one in 1920's Japan. The creators were even thoughtful enough to use color patterns that were popular with the time for the stabilization of the costumes. It is truly a full dedication to detail that is appreciated. The cinematography, story, artistry as well as voice acting (and eye candy Kusuriuri) make for a wonderful blend of Japanese themed horror mystery tales. I can only hope for more cultural tales like this in the future. Side note: The "Mononoke hunting theory" can be applied to many forms of discovery modernly (shape, truth and reason) and is fun to translate into modern life even if you may not be afflicted by a Mononoke. This show was amazing. I got many goosebumps watching this and the visual is just stunning. The stories are just so bizarre and it makes it even better. I loved the main character. He was really strange and mysterious and it left me wondering about his own story. The art work is slightly jarring at first, but I found I grew to like it half way through. The various stories are all interesting, He goes around essentially exercising spirits, it's like mushishi, with a bit more action. The main character is slightly mysterious, and really cool. Short, sweet, and beautifully made. The episodes are different stories and the way they are conjured are also fantastic. Definitely rewatching in the future. The style is beautifully decorated and ornate, the plot is well paced.Most of all ou love the main character.